I use the rest of the Valentine’s Day weekend to put the new amplifier through its paces. It produces a bowel-loosening roar that pleases me greatly. When I turn the volume up past three, every window in the house rattles; I’m pretty sure I see God at one point. Over the next couple weeks, I set about rebuilding my chops. I play for a couple of hours in little twenty-minute bursts throughout each day, running through every song I know and learning a bunch that I don’t. My calluses come back. And all the while, I ponder what to say in my ad. Rochester’s a good-sized city — with 200,000 residents, it falls just outside the U.S. top 100 metro areas — and it’s got most of the ingredients for a good band scene: several universities, including a world-class music school; tons of bars and clubs; a couple of good college radio stations; thriving visual arts and theatre; and a free alternative weekly newspaper. 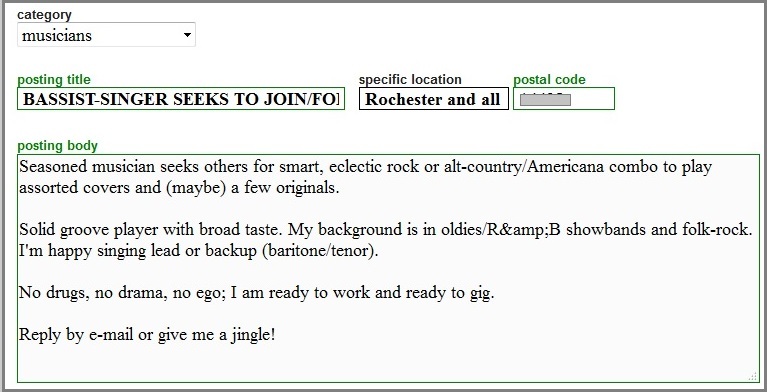 It’s also got a Craigslist page, and there’s where I will start my search for a musical situation. I was already safely married before online dating apps were a thing, but I imagine this must be how filling out the profile feels — trying, in just a few words, to find suitable partners for a fulfilling commitment, or at least a few wild nights. How do I sum up the musical influences and affections I’ve picked up in five decades above ground? I like New Wave and spaghetti westerns, classic songcraft and discreet psychedelia; I like Joni Mitchell and John Cale, Nick Cave and Dire Straits; I like singer-songwriters and widescreen guitars, hoary old classic rock and weirdo experimental noise. I like Tom Waits, Richard Thompson, and U2; I like the Waterboys and the Byrds, Steely Dan and the Church, Chris Whitley and the Stones and School of Seven Bells and Nina Simone. I like it all — like to listen to it, like to play it. What do you make from that? What do you do with that? I take stock of all this, and of the catalog of songs I’ve written over the years. At around the same time as the bass amp, I got myself a little USB cassette rig and set about transferring twenty years’ worth of home recordings to digital, sifting through dozens of hours of noodling and riffing to unearth the songs — well over a hundred in all, of which maybe ten are any good. And as I listen, a certain folk-rock strain keeps glimmering out. Between my time with We Saw the Wolf and my years leading a choir, I became something of a scholar of traditional music and hymnody. It’s a deep well from which to draw, and there are strange things living in its depths that come up occasionally in one’s bucket; it changed the way I write, helping me find my own voice as a songwriter. I wrote “Jack o’ Diamonds” — my first new song of 2016 — right around the time I started looking seriously for a gig. It was meant to be a statement of purpose, a calling card, a theme song. The instrumental break and some of the lyrics are derived from an Appalachian folk song called “The Coo Coo Bird” (sic). Words, music, all vocals and instruments by Jack Feerick. With no better tag to put on it, I call it “Americana” and call it a day. To cover my bets, I’m answering ads, too — for singers wanted, as well as for bass players. Muhammad meeting the mountain half-way, I guess. I do this for a couple of weeks. I compose gentle let-downs for a lonely experimental keyboardist who wants a studio buddy to help him with his aimless noise paintings. I don’t want to go down that rabbit hole; we have invested good money in this, and I want to get out and gigging. And then, as winter starts giving way to spring, things start coming together. I find myself booking auditions.